Self supporting portable frameless onion tanks are used for containing large volumes of water. 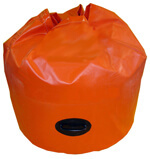 The advantage of these tanks is they are totally collapsible and can be easily stored in its own storage bag. It can be easily stored in a truck or cargo hold in an aircraft. It only requires one man to set up as it has no frame work. These tanks do no inflate so no pump or auxiliary air is needed. No assembly required as it supports itself as it is filled. All tanks are supplied with one threaded flange coupling in your choice of 1 1/2” to 6” NST or IPT, Male or Female. All seams are welding for longer life. 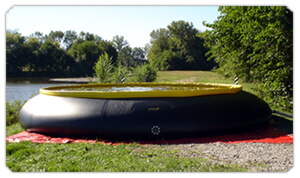 The construction of the tanks is heavy duty vinyl (PVC) and can be easily repaired. Other accessories available such as ground covers, patch kits, stenciling, top covers, or Storz connections. All tanks are protected by a one year warranty against defects. Up to 2000 Gal. Models Go UPS, Larger via Common Carrier. You can choose your preferred connection type, coupling size, threaded type and color in shopping cart. Protects portable pillow and frameless onion tank bottoms from excessive wear, abrasion or punctures. Increases tank life. Stays cleaner. All seams are heat sealed for longer life. Available for 600 to 4000 Gallon Tanks. All Sizes are Carried via UPS. You can choose your preferred color in shopping cart.